Our teacher discussion guide for Cyclone, a book about learning to overcome guilt, contains questions and activities to help guide your lesson. 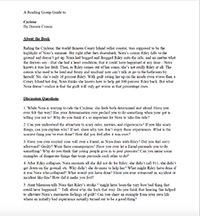 The discussion questions are designed to help students understand the content better, while thinking critically. The extension activities include writing prompts, research topics, and much more!